We absolutely love this simple stir fry recipe that will make 6 nice servings. Be sure to use fresh, local kale and carrots from the farmer’s market to make this recipe the best it can be! This recipe can be made for under $30 using all local ingredients, or about $5/serving. Cook 1 cup of quinoa according to package directions. Set aside. Cut roast into bite size pieces, salt and brown in large skillet with olive oil. Remove from skillet and add additional olive oil, sauté onions until translucent then add garlic and sauté about a minute. Add carrots, red pepper, honey and Braggs – stir together until vegetables are thoroughly coated. Cover and allow to cook until veggies reach desired tenderness – stirring occasionally. Add kale making sure to mix it in thoroughly, then add cooked pork and quinoa. Stir until all is completely incorporated. Let sit covered for 5 – 10 minutes before eating just to let all the flavors gel together. 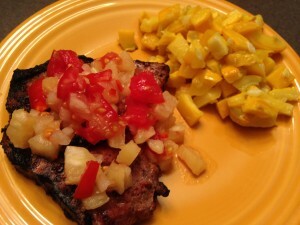 This an awesome summertime recipe that we just love. 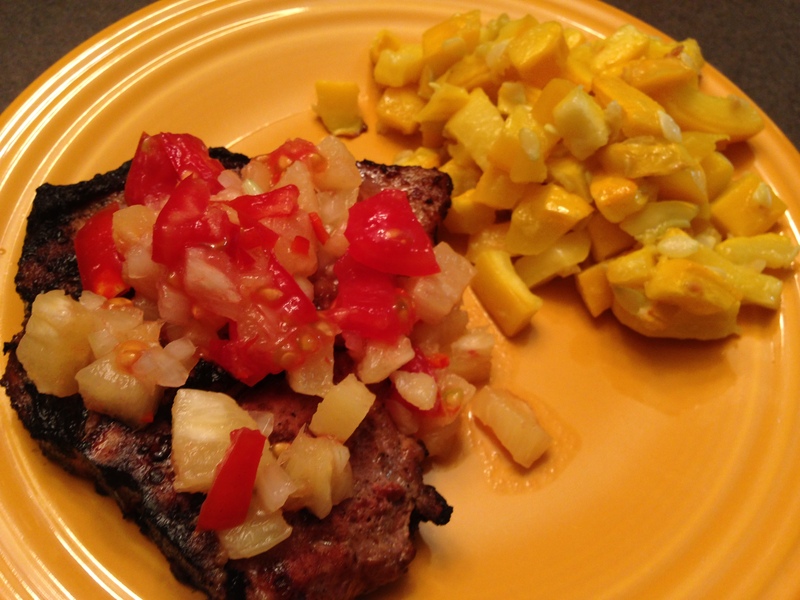 Make the most of some fresh pineapple and vine ripe tomatoes while in season! For the marinade: Blend all the ingredients in a large bowl. Place in a resealable plastic bag and add the pork chops. Marinate in the refrigerator for up to 3 hours. For the salsa: Mix all the salsa ingredients in a medium bowl. Taste for seasoning. Set aside for at least 20 minutes to let flavors meld. Preheat grill to medium heat and remove chops from marinade. Grill for 8 minutes per side for a medium chop. Remove chops from grill and let rest 10 minutes before slicing. Spoon the salsa on top, serve and enjoy!